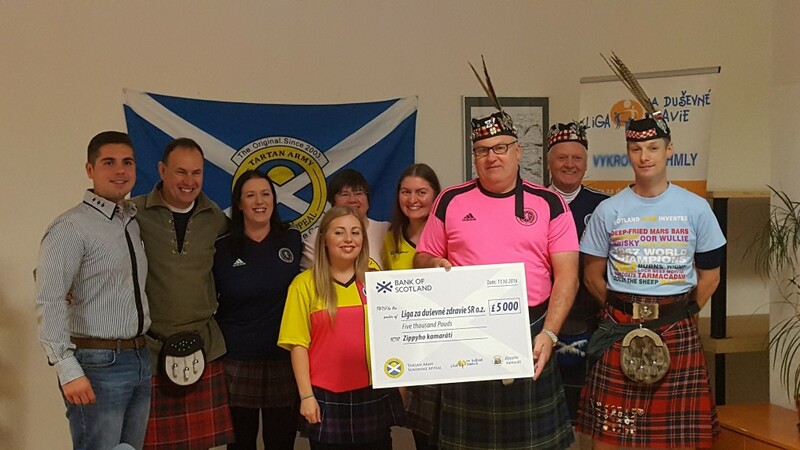 Mr Neil Forbes, vice chair of the Sunshine Appeal volunteered to run the donation for this – Scotland’s first ever international against Sloavkia. The Steering Group had identified “Zippy’s Friends” as the recipient charity and I’m sure I’m not the only person of a certain age who figured there were surely more worthy recipients than “Geoffrey, Bungle and George”. Zippy’s Friends is a programme that helps young children – five, six & seven year olds – to develop coping and social skills. It is currently running in primary schools and kindergartens around the world. The programme has been developed specifically for five to seven year-old children of all abilities. It teaches them how to cope with everyday difficulties, to identify and talk about their feelings and to explore ways of dealing with them. It also encourages children to help other people with their problems. Zippy’s Friends is based on extensive research and has been evaluated in many countries. It has also been endorsed by the World Health Organisation and national governments. The presentation was effectively split into 3 parts. The first was a more formal occasion at the offices of The League For Mental Health where a cheque for £5000 would officially be handed over. The next would be in Trnava itself (where the match was played) at a school attended by children and parents who would be benefiting. 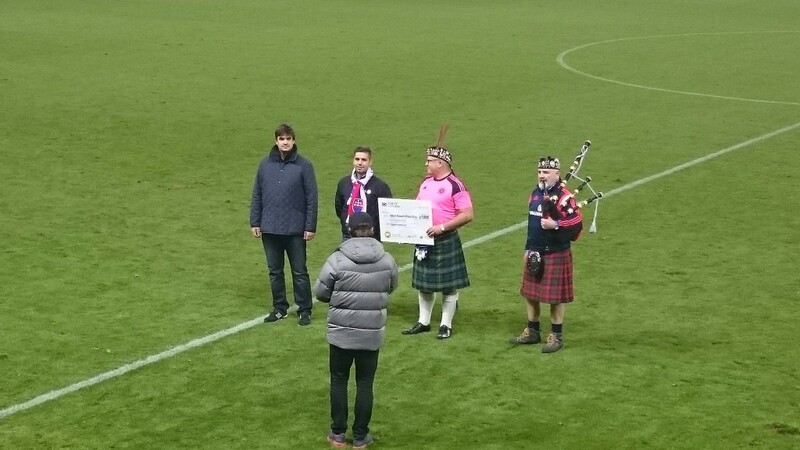 Finally, an informal cheque handover was to take place on the pitch at half-time. So a congregation of around a dozen Sunshine Appeal supporters and Steering Group members gathered at an office about mile South of the city centre on the other side of the Danube. The event was set up as a press conference so there were also around a half a dozen journalists there as well as a TV camera and reporter. When everyone was ready, Dougie Wotherspoon piped in the four people who would be involved in the press conference: Mikulas Kevely representing the charity, Peter Hlinican who interpreted, and Neil Forbes and John Daly of the Sunshine Appeal. There followed a (pre-prepared) question and answer session between the respective members of the top table – all designed to explain what each body did. Then at the end, it was time for free floor questions and a few of the journalists duly obliged. One question about how the game would go was diplomatically answered by Mr Daly when saying that he thought Scotland would only win by 3 goals to one. So close on that scoreline if not the result, John! The TV footage was used in a short news item which appeared on Slovakia’s equivalent of the BBC News At Six. Great visibility for Zippy’s Friends and as ever, probably worth more than the TASA donation. You can see how that turned out here from 4:55. Afterwards, we were invited to help ourselves from a rather nice buffet that had been laid out. We all made rather half-hearted attempts since most of us had just had breakfast! It was an early meet up – 10.30 if you will. Well – that’s early for the TA on match day. Mikulas drove us from Bratislava to Trnava where the school was located. 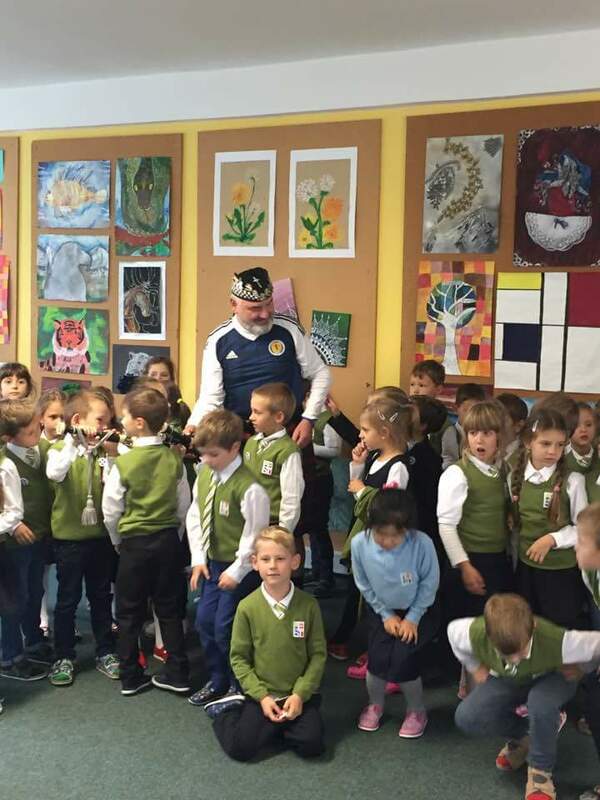 He then about turned and went in search of Dougie Wotherspoon who, as the Sunshine Appeal Official Piper, had agreed to gie us a blaw at the school. Dougie had travelled to Trnava a little earlier on one of the WESTA buses. We entered the school and were met at reception by the head teacher and were taken up to meet some of the kids. Even on the short walk into the school we were already turning heads – folk looking at these men in skirts. The school was a bilingual establishment where the kids were taught in the English language. Zippy’s Friends involvement was to deliver their approach to the prevention of mental health issues by addressing such areas as bereavement, change, bullying – all of which can impinge on the mental well-being of children. The children had been assembled for our arrival and about 50 or so greeted us warmly and noisily. Four chairs were provided for us to sit on facing the children. Four SCHOOL chairs. Four chairs for Primary 1 and 2 kids. Difficult enough to get down into – almost impossible for us to get up out of. And that all-important kilt-wearing decorum. 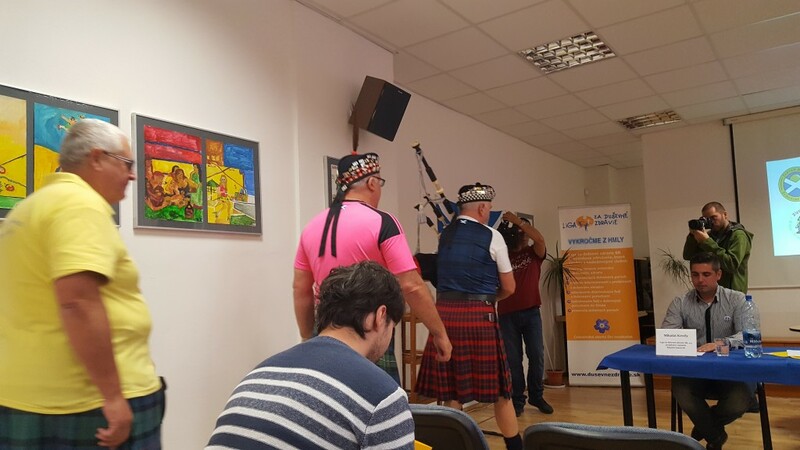 Dougie had arrived and gave us a splendid session on the pipes. This caused much excitement. One of the teachers then had the idea of getting Dougie to play for the pre-schools. At the other end of the school then, Dougie struck up and, to much general hilarity, the kids were all covering their ears. A disconsolate Dougie had to be convinced that it wasn’t due to the quality of his playing. We said our farewells and took our leave. And now it’s me (Micky) again…. I was only able to observe the on-the-pitch proceedings at half-time from the Scotland end and through a haze of strong Slovakian ales and plum brandy. However, this is how it looked to me…. Mikulas, Neil and Dougie appeared on the pitch along with the Slovakian tannoy man, who proceeded to describe the work of both Zippy’s friends, first in Slovakian and then in English. This seemed to go down quite well with the locals and TA alike. The oversized cheque was handed over and Dougie piped the party off the pitch. Click here for a wee video from Bili Andeli showing the pitch-side presentation.